The company known as Batsheva-the Young Ensemble made its Joyce Theater debut with the composite work “Decadance”, many of whose sections have been presented in the recent past, in New York and on different companies. Thus, opening night (Sept. 27) was not so much an opportunity to see new work by Israeli choreographer Ohad Naharin, the company’s artistic director, as to look at the work anew as performed by 16 fresh-faced and limbed dancers. In “Decadance”, the performers are the main event, their individuality is the subject, and the audience championed them. When the dancers took their bows at the end of the 85-minute work, they received a standing ovation. The artists who made this audience member especially delighted were the poetically understated Matan Cohen, the intensely serious Korina Fraiman, the confidently loose Chiaki Horita, and the volcanically cool Kyle Scheurich. The Young Ensemble, as its name connotes, is a troupe whose dancers are between the ages of 18 and 24. Their tenure lasts just two short years. During this time they live and breathe the Gaga technique, whose codified vocabulary (which is now articulated in a Gaga dictionary) continues to be constructed by Naharin. Gaga words are packed with images. In the dictionary (made available to me by a Juilliard School dance student), Kada means bones floating inside the flesh. Magma means feeding texture from the hands and feet into the rest of the body. The words, as translated by Naharin into choreographic phrases (and often done in uncanny unison), produce movement and theatrical qualities that read to the viewer as hushed and screaming, reverent and absurd, banal and virtuosic. Gaga offers dance artists a magnetically-attractive experience: the ability to formulate extreme states of expression—both emotional and physical—through metaphoric language that connects the mind and the body. Judging by other works created by Naharin, it’s clear that the choreographer likes lineups in which the dancers face the audience like bold soldiers, or resigned camp victims, or defiant teenagers. These lineups, which have a photographic stark stillness, are interpolated with frenzied movement, often done by a solo dancer in four counts. In this space of a human breath, one dancer packs in a lifetime of movement. The effect is like watching a six-minute solo in fast-forward speed. 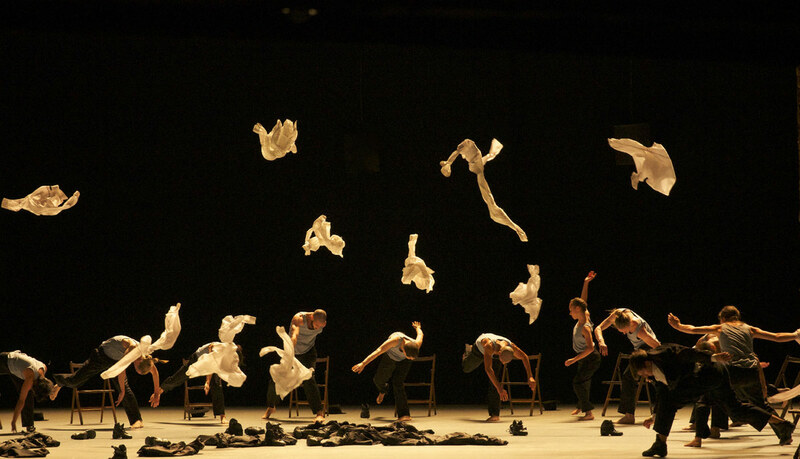 Naharin seems to be commenting on the breathless pace of modern life, as well as the inner life, in which emotions and ideas whirl around (especially when we are young), much like the end of a powerful washing machine’s spin cycle. Naharin’s “Decadance” works as a full-length piece because its sections are organized to provide maximum contrast. For example, in the second section, set to a pulsating Arab folk musical arrangement, the dancers move with a cartoon intensity. In the third section, set to ambient recorded sounds, a mood of longing pervades: the dancers are seen in tableaux, then they lope across the stage like caravans crossing a wide expanse of desert. “Decadance,” as performed by Batsheva-The Young Ensemble, will be at The Joyce until October 4. Then they will meet audiences in Japan (two cities) and Melbourne, Australia. In these places, they will likely win more hearts. This entry was posted on Friday, October 2nd, 2015 at 12:55 pm	and is filed under The Torn Tutu. You can follow any responses to this entry through the RSS 2.0 feed. Both comments and pings are currently closed.